1. Ancient Egypt map: Nile delta. A delta is a point in the course of a river where it enters a larger water body. It is named a delta when the river subdivides into numerous tributaries as it pours into a larger water body e.g a lake, sea or ocean. The Ancient Nile delta is approximated to be 90 KM in length and 240 KM in width along the coastline. Overtime, people have been settling around the delta for thousands of years due to its rich agricultural soil deposits. The ancient Nile delta originally had several tributaries, The tributaries of the Nile delta spread out in a V shape and poured its waters into the Mediterranean sea through the lower part of Egypt. This area was vastly covered by deposits of silt and was pushed outwards playing a major role in creating an Egyptian boundaries. Nile Delta tributaries were seven in number and spread out from East to West. The lower part of Egypt was mapped by the Nile delta. 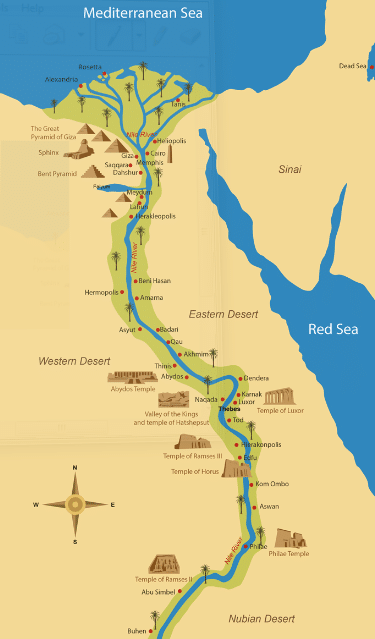 Ancient Egyptians relied heavily on the Nile river for a reliable source of water for both agricultural and also for the development of commercial settlements. Despite the floods experienced along the Nile and its lower parts, the predictability of the Nile waters enabled the Egyptians to plan the growth of crops in time. In addition to the Nile being a major source of water, it also housed fishes and waterfowl. Furthermore, canoes and boats were used on the Nile for transportation purposes from one end to another. 2. Map of ancient Egyptian empire. The Ancient Egyptian empire was formed during the reign of the first Egyptian King. This period was around 31oo BC and occupied the tip of the Nile delta. It was at this period when the major capital of ancient Egypt was formed. The ancient Egyptian empire survived relative stability despite periods of transition in leadership, the empire was invaded by foreign powers during its period of slow decline by the command of Alexander the Great. Greek kingdom ruled Egypt for a long period of time until it was taken over by the Romans. 3.Map of ancient Egypt and Nubia. The north of a Nubia creates the boundary of the upper part of Egypt the Nubian and Egyptians had a long term peaceful relationship mainly because they traded together in commodities such as gold and also engaged in slave trade as a restful of this interaction the people of Egypt conquered the Nubian and thus expanding their territories to the south. The upper and lower part of Egypt were ruled by different kings up to the time of pharaoh Narmer who unified both upper and lower Egypt, Nubia served as a trade point between the Egyptians and the people of Nubia as a result of greed for trade Egyptians decided to conquer the Nubian so as to control trade boundaries. Egyptians did this mainly because Nubia was the gateway to acquire African richness and as they were expanding their territories, they built forts and with this it lead to the Nubians being assimilated by the Egyptians.